Powered by a PC USB port, needs no batteries and other external power. Flexible and adjustable metal neck. Pluged into your PC USB port, it starts to bring you brightness right now. Lightweight, compact, space-saving, easy to carry and handle. Color: black, Silver, blue, gold, red. 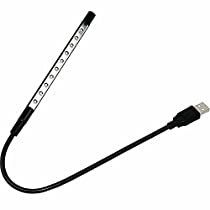 Bright white LED can ensure clear vision in the dark, at night or in your online gaming time, plug in a USB lamp protection direct eye fatigue is not easy, but also save electricity.